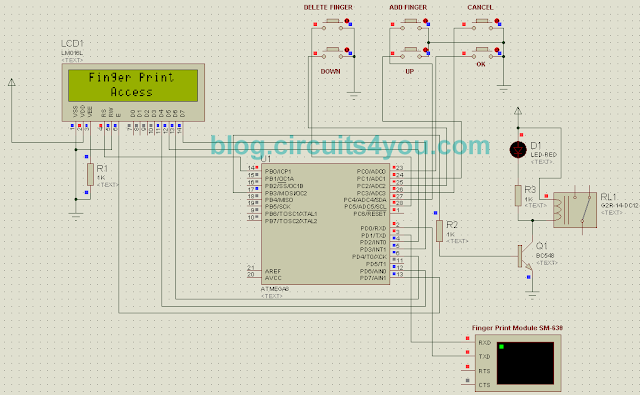 This AVR microcontroller based project demonstrates Finger print based access control / security system, in this project we have provided all required data, PCB, Code, Circuit Diagram, Proteus Simulation. This project operates a relay based on valid finger detection. It is provided with 6-Keys for Addition, Deletion of Finger Print. It uses standard SM-630 Fingerprint Verification Module developed by Miaxis Biometrics Co., Ltd.
● Self-proprietary Intellectual Property Optical fingerprint collection device, module hardware and fingerprint algorithm are all self developed by Miaxis. ● High Adaptation to Fingerprints When reading fingerprint images, it has self-adaptive parameter adjustment mechanism, which improves imaging quality for both dry and wet fingers. It can be applied to wider public. ● Low Cost Module adopts Miaxis’ optical fingerprint collection device, which dramatically lowers the overall cost. ● Algorithm with Excellent Performance SM630 module algorithm is specially designed according to the image generation theory of the optical fingerprint collection device. It has excellent correction & tolerance to deformed and poor-quality fingerprint. ● Easy to Use and Expand User does not have to have professional know-how in fingerprint verification. User can easily develop powerful fingerprint verification application systems based on the rich collection of controlling command provided by SM630 module. All the commands are simple, practical and easy for development. ● Low Power Consumption Operation current <80mA, specially good for battery power occasions. 1. Display "Add Finger" "Place Finger"
3. Assemble components using above files. ERROR is here incorrect chip "avr-gcc -mmcu=atmega128"
i change it to atmega8 and it compiled successfully thanks for your help. mam, Plz provide R305 module interfacing with atmega16 because i have a R305 module already and i don't want to buy another one. Using which software can I compile and build this c code? I assembled this circuit but i can't access finger print module(R305). Is there any fuse bit used for programming atmega8? Kindly send me the code for R305 fingerprint Module to my mail@ gourabagrawal@gmail.com. Thanks in Advance. nice work,i respect you bro.. please, i will like to know the value of crystal used. can anyone tell me how to simulate and run the program in proteus... what i should write in virtual terminal when program runs?